This is the perfect opportunity for independent sales reps looking to sell the services of a revolutionary online solution that takes the pain out of managing a company's cash flow. Why Sell Cash Flow Planning Software Solutions? Effectively managing a company's cash flow can mean the difference between success and failure. However, for many business owners it's a skill they unfortunately do not possess. Let's face it, keeping tight financial records and forecasting is traditionally a time consuming and somewhat burdening task. The result of poor cash flow management is a company that leaks money unnecessarily and runs the risk of a deficit when the time that funds are needed comes. The following interview with will give independent sales reps an idea of what it's like to sell the services of the leading online cash flow management solution on the market. Where did the inspiration for Cash Flow Mapper™ come from? Balance Sheets & Cash Flow Statements which measure past activity. Budgets and other planning activities, such as cash flow forecasting, to set out anticipated future activity. Standard accounting systems make producing the first group of reports easy and it's often possible to produce a useful report straight out of the system. Those same accounting systems also facilitate the input of budgets which can be used for variance reporting. Cash flow forecasting is the most important function in finance and business management. Future marketing campaigns, sales promotions, capital purchasing or financing, new product or service offerings, price & operating expense changes and myriad other events all depend on it because they all have cash flow implications. Unfortunately, most accounting systems do not provide this capability. Yet cash flow forecasting is crucial to the management and control of every business. Whilst reporting monthly profit and loss is important, very few business transactions actually occur in a neat monthly fashion. They can occur on a weekly or quarterly basis, in periodic clumps or as one-offs to name but a few possibilities. A transaction’s value can be subject to change upon contract re-negotiation or due to inflation. Not to mention that cash and profit are different concepts, and rarely, if ever are the same value. All these factors must be considered. Cash balance itself is a dynamic beast. It’s good to know what happened in the preceding month, but it’s more crucial to anticipate what’s going to happen tomorrow, next week, 6 months, even years down the track as well so you can plan for shortfalls or take advantage of large surpluses. Cash Flow Mapper™ enables this to be done. While we solve the problem of cashflow management, our business focuses on solving these issues using Software as a Service technology (SaaS) - where software is accessed from remote services via the internet - has rapidly grown in acceptance over the past few years. This is due to increased internet speeds and improved security around remote servers. A consequence of this is the fact that businesses don’t need to house and maintain expensive IT hardware such as servers themselves in order to store the software they need, thus saving in capital and operating costs. Who are your customers typically? The business owner or their CFO / FC – whoever in the business needs to track cash flow. Those in the business advisory sector: Consultants, Business Advisors, Accountants, Bookkeepers. Cash Flow Mapper™ can also be used for personal budgeting. Independent sales agents are the perfect vehicle to spread Cash Flow Mapper™ into all markets. All that is needed is an internet connection and a computer for the agent to demonstrate the software. That’s all the customer needs as well! The software can be sold either face to face or from the agent’s own office, and on a one-to-one or one-to-many basis. Why would sales agents have an edge selling your products/services? Cash Flow Mapper™ is well suited to agents as all that is needed is an internet connection and training of the software. Training rarely takes more than 45 minutes. Being future-focused, Cash Flow Mapper™ is the perfect complement to historically-based accounting software. And who doesn’t want to know what their bank balance will be at any given point in time? Where do you see the software sales industry going in the future? More and more businesses are accessing the software they use day-to-day via both mobile and office-based devices. Having crucial financial information at your fingertips at any time is rapidly becoming standard, so SaaS (software as a service) applications are increasingly becoming the first choice for savvy business owners. What makes your products unique and innovative? Numerical reports for the financially minded. Graphical reports for those more visual – any user can understand this report and make decisions based upon it. Warning signs for when you will breach a pre-set “comfort” level of cash. You are completely free to forecast cash flow for any length of period you like. Varying scenarios can be simultaneously viewed for comparison. Sub-plans can be added together for an overall picture – ideal for project-based businesses. All plans have daily commentary with cash movements and balance. It is also more flexible than other products in terms of planning time span and being accurate to the day. 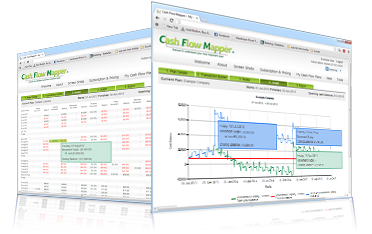 What are you plans for the future of Cash Flow Mapper™? Cash flow forecasting is a global concept, so the translation of Cash Flow Mapper™ into other languages is on the agenda; the attainment of a license for exclusivity of Cash Flow Mapper™ in a given language and / or a number of jurisdictions is a great opportunity for a sales rep. Using existing information as a basis for cash flow forecasting makes sense. To that end, Cash Flow Mapper™ is building API links with cloud-based accounting packages (there is already one live) to import certain information to build a cash flow plan around. What are the downsides of not accurately forecasting cash flow? As SaaS providers store sensitive information on behalf of their clients, they are subject to Privacy Legislation. Cash Flow Mapper™ is secured by industry standard 128 bit encrypted SSL channel to protect all data. Are in the business of providing (cloud-based) software solutions for businesses. Cash Flow Mapper™, being future-focussed, is the ideal complement to historically-based accounting software. Have as contacts Business Owners and / or their advisors. The latter will tell you that cash flow management and the ability of their clients to do this is one of the main problems they have. Here’s the solution. It’s worth noting that in a recent interview*, the Australian CEO of a leading accounting software company said that in a survey his company did, 40% of small businesses had no financial software at all. The least they can do with is something that will tell them what’s happening in their bank account!